Salut mes amis! Here’s a quick update on a few things that have been going on in the world of Matilda Pink. The sweetest thing was an article by the wonderful Ian Price in FDQ magazine. If you can’t find the magazine at your local bookstore, check them out here. For vintage doll lovers like me, you’ll immediately appreciate Francie on the cover. And it gets better! This issue also introduces Anouk, a new fashion muse with vintage style. And for my fellow Blythe enthusiasts, Dolly Treasures, the Instagram Superstar, is also featured. Doll friends, you MUST see it! Now, as far as what I’ve been sewing…..well, not as much as I want to! There are a few new items for Mamzelle de Paris in my esty shop. And before that, there was a very fun project for a dear friend, but I don’t have any of my own photos, so that story will have to wait! There is a certain romance about air travel ‘back in the day’. Flying anywhere was a precious experience and passengers dressed with more concern for style and propriety than comfort. No one took that idea more seriously than the flight crew. 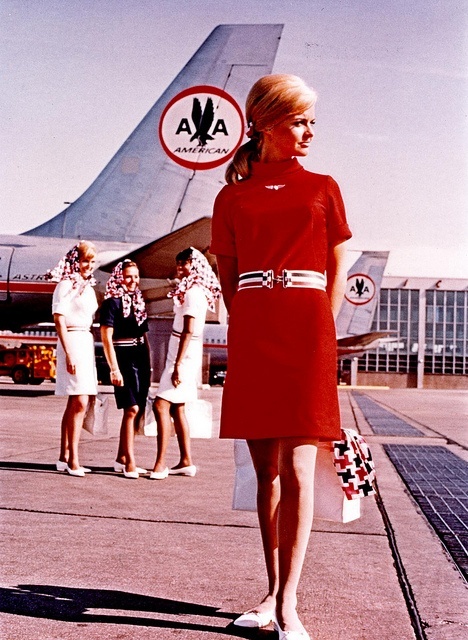 Could there have been anyone more glamorous than a stewardess? I remember my first flight, when I was only four years old. I can’t confirm any of my memories, but there are some things which left indelible marks on my psyche. The smell of jet fuel, for one thing, takes me right back. One whiff and I’m four years old ready to embark on a thrilling adventure. And the smell of the waxy crayons they gave my brother and me to scribble with has been forever linked with a memory of flight. But one of my best memories is of the absolutely stunning stewardesses. I had never seen women so beautiful in my short life until then. For years I would imagine that nothing could be better than to grow up and become one.